Oatmeal is made from the ground or rolled seeds of oat grass (Avena sativa). It is cooked as cereal or used as an ingredient in baking. Wild oats were eaten as early as the Neolithic and Bronze Ages. The Romans cultivated it. The Teutons and the Gauls used it to make gruel. Often growing weed-like amongst wheat and barley, oats thrive in cold climates with a short growing season, hence its prevalence in Scotland, Ireland, Scandinavia, and Germany. In those countries it became a basic foodstuff well into the nineteenth century. Haggis—a blend of oatmeal, goat organs, onions, and spices that are roasted in pieces of goat stomach—is still enjoyed as a traditional Scottish meal. In the United States, however, oats were viewed as nothing more than horse feed until a German grocer named Ferdinand Schumacher emigrated to the United States in the mid-1800s and saw a ready market for oatmeal in the growing immigrant population. Up until that time, much of the United States was farmland. Breakfasts consisted of meats, eggs, breads, potatoes, fruits, and vegetables. The immigrants arriving in the growing urban areas had neither the means nor the resources to produce such morning meals. The climate of the American Midwest was also conducive to growing oat grass and farmers were producing 150 bushels of the grain per year. In 1854, Schumacher began grinding oats in his Akron, Ohio, store, using a hand mill similar that used to grind coffee beans. Within two years he opened the German Mills American Oatmeal Company. Using a water wheel to generate power and rotate two large millstones, Schumacher's business was able to fill twenty 180 lb (81.7 kg) barrels with oatmeal daily. This method for grinding oats was not revolutionary. It had been used for centuries. Oats were hulled by passing them between two stone wheels turning in opposite directions. The hulls and residue were sifted out of the oat grains, which are known as groats. The groats were crushed under a second set of millstones, producing a meal that could be eaten after it was cooked for three to four hours. But there was still enough powdery residue in the groats that the cooked oatmeal was pasty and lumpy. One of Schumacher's employees, Asmus J. Ehrrichsen had the idea to replace the millstones with rotating knife blades. This substantially reduced the amount of residue and produced a meal of uniform taste and flakiness. However, one-quarter of Schumacher's oats were still ending up as residue, a product that he could not sell. Therefore, in 1878 Schumacher purchased a set of porcelain rollers from England. By rolling the groats, the residue was virtually eliminated and the cooking time was decreased to one hour. In nearby Ravenna, another mill, owned by Henry Parsons Crowell, William Heston, and Henry Seymour, was also selling steel-cut oats. Instead of selling them in bulk out of an open barrel, Crowell measured out two pounds and placed them in clean paper boxes with the cooking directions printed on the outside. They called their product Quaker Oats. Oatmeal manufacture involves harvesting, washing, steaming, and hulling the oats. Standard oats are steel-cut, whereas quick-cooking oats are rolled between cylinders to produce a flatter flake. Once flaked, the oats are roasted and packaged. sorter that separated the oat grains by size instead of weight, ventilation systems that reduced spoilage, escalators and endless conveyer belts to move the product to and from the warehouses. Oat grain is the only ingredient in oatmeal. The seeds of the Avena grasses are harvested in the fall. The thinner-skinned grains are preferable as they have a high protein content without being overly starchy. Additionally, the thin-skinned oats will yield 60% oatmeal, while the yield of thick-skinned oats is 50%. Oatmeal millers develop close relationships with their farmer-suppliers in order to insure that they receive the finest quality grain. The grains should be milled as soon as possible thereafter to prevent spoilage or infestation of boll weevils. Rancidity is a major concern in the milling of oats. With a higher fat content than other cereal grains, the lipase enzyme can create a soapy taste. This is controlled by steaming the oats. 1 The oats are loaded onto moving trays and washed under a high-intensity water spray. Often the trays are perforated so that foreign material is discarded underneath. 2 The cleaned oats then move to a large steamer where they are subjected to moist heat for a predetermined length of time. 3 Standard oats are those that have been steel-cut. The oats are run through a machine with razor-sharp knife blades. Quick-cooking oats are rolled between cylinders to produce a flatter, lighter flake. 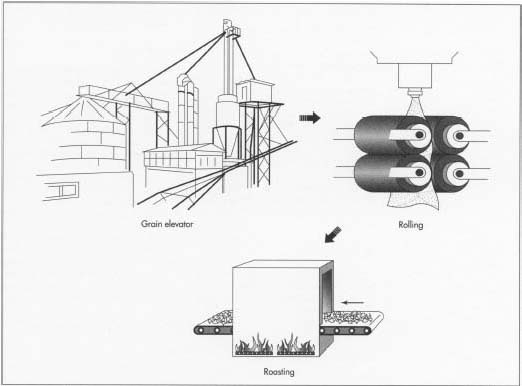 These processes are usually repeated several times to produce the type of oat flake that is desired. In both processes, the hull is separated from the grain. The hulls are sifted out and used for other purposes. 4 The hulled oats are then placed into a roaster where they are toasted at a preset temperature for a pre-determined amount of time. 5 Pre-printed containers are filled with pre-measured amounts of oatmeal. A lid is vacuum-packed onto the top of the container. The containers are then loaded into cartons for shipment. The oat hulls that have been removed from the grain are often used for livestock feed and as fuel. The most common byproduct of the hulls is furfural, a liquid aldehyde (dehydrogenated alcohol) that is used as a phenolic resin or as a solvent. The list of products that contain furfural include nylon, synthetic rubber, lubricating oils, pharmaceuticals, antifreeze, charcoals, textiles, plastic bottle caps, buttons, glue, and antiseptics. Ironically, when Schumacher first started grinding oats in his Akron grocery store, the press had a field day with the idea of people eating horse food. Cartoons and editorials poked fun at the so-called oat-eaters, accusing them of robbing animals of their feeds and developing a whinny. Eventually, the medical profession found that the human consumption of oats was beneficial for the entire population, not just invalids and infants. By the end of the twentieth century, oatmeal was touted as one of the primary elements of a healthy diet. In 1997, the Federal Drug Administration ruled that manufacturers of foods made with the soluble fiber from whole oats could claim that when part of a diet low in saturated fat and cholesterol, these foods may reduce heart disease risk. Oatmeal was also being used by the food processing industry as an ingredient in meat substitutes. Marquette, Arthur F. Brands, Trademarks and Good Will. New York: McGraw-Hill, 1967. Very usful info, thank you! I read elsewhere that oats containes phitic acid that prevent our body from fully absorb the iron that is in the oats. I also read that heating the oats neutralizes this bad effect of the phitic acid. Are the temperatures of the steaming and roasting in the production process enough to nutralize this bad effect of the phitic acid? Or does it have to be actually cooked?